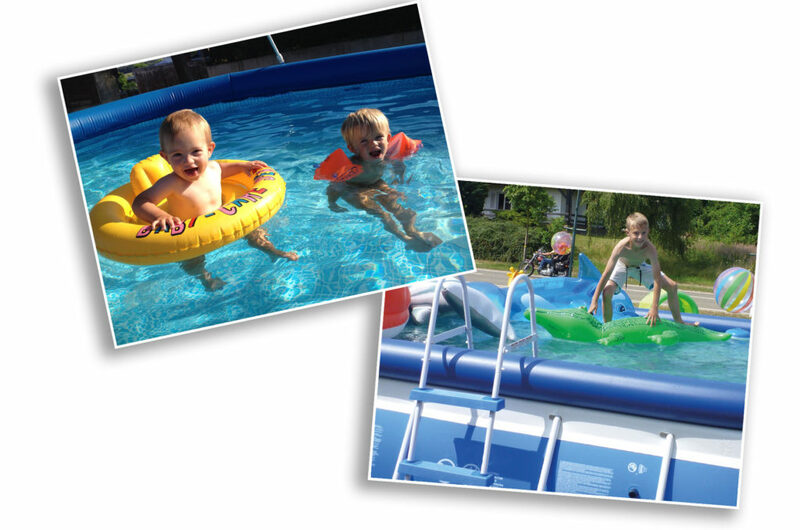 Children love playing in the water but they quickly get cold. 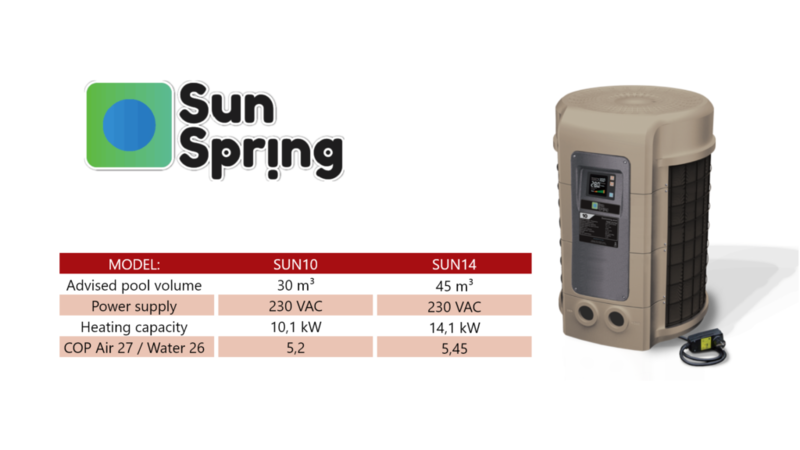 Constantly jumping in the pool and climbing out, drying up and starting all over again certainly sounds familiar… In order to guarantee hours of fun, House of DURATECH has developed the ideal solution: the Sun Spring heat pumps. Make sure the front of the unit is accessible for future service. 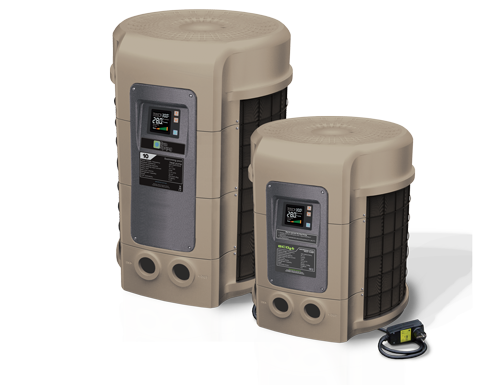 Keep the surrounding areas of the heat pump clear of all debris. Keep all plants and shrubs trimmed and away from the heat pump. Keep lawn sprinkler heads from spraying on the heat pump to prevent corrosion and damage. Use a deflector if needed. If the unit is installed under a very sharp roof pitch or under a roof without a gutter, a gutter or diverter should be fitted to prevent excessive water from pouring down onto the unit. Do not use the heat pump if any part has been submerged under water. 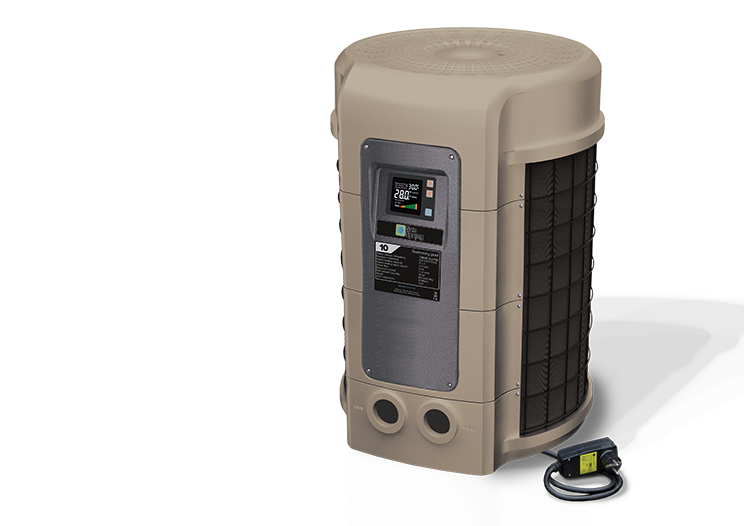 Immediately call a qualified professional technician to inspect the heat pump and replace any part of the control system, which has been submerged. The desired temperature can directly be set with the arrow keys. The setting will automatically be stored in memory. Press both arrow keys at the same time and restore electrical power to the unit, than release the keys. 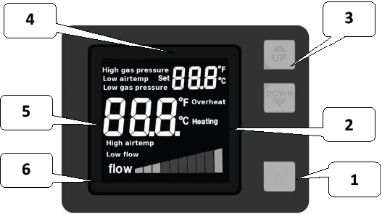 The flow bar is a graphical representation of the water volume through the unit. The heat pumps has it best performance when the flow bar is in the green zone. The graph is only valid after at least 30 minutes of operation. The flow bar also represents the three-minute time delay before the actual start of the unit. The indication “flow” is not visible; the small block at the very right end of the flow bar is flickering and disappears after a while. When they are all gone, the unit will start. 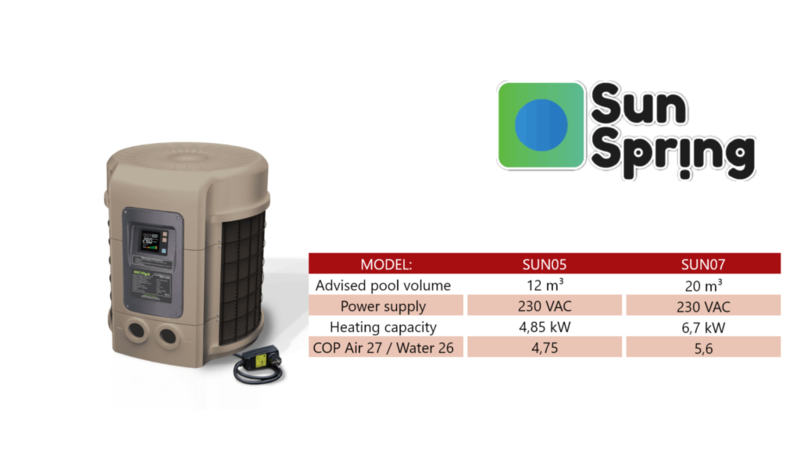 By its operation of heating the swimming pool water, the air taken by the unit is cooled down and water may condense on the fins of the evaporator. If the relative humidity is very high, this could be as much as several liters an hour. Sometimes this condensation water is wrongly considered as swimming pool water. Turn off the electrical power to the heat pump at the main breaker panel. Shut off the water supply to the heat pump. Disconnect the water inlet and outlet and let the water drain from the heat pump. Re-connect the water inlet and outlet loosely to prevent debris entering the connections. Inspect the system for any debris or structural problems. Connect the water inlet and outlet unions firmly. 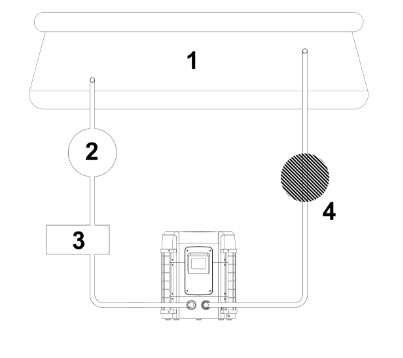 Turn on the filter pump to supply water to the heat pump. 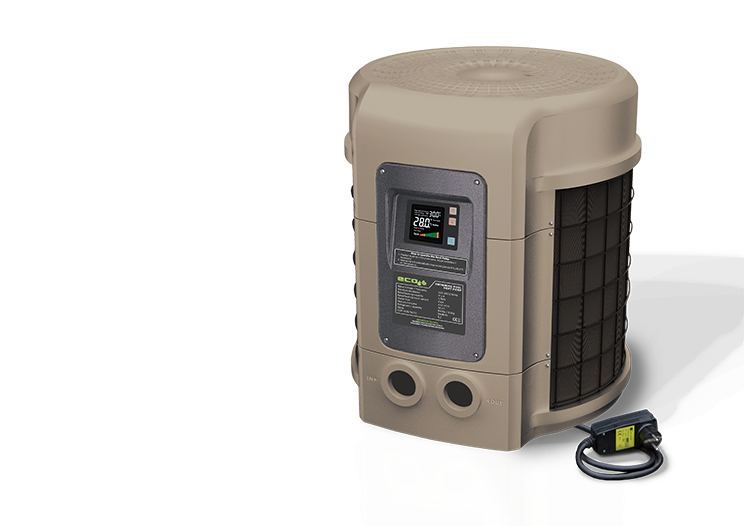 Restore electrical power to the heat pump and switch it ON. Check the water supply to the unit often. Low water flow and air entering into the system should be avoided, as this will diminish the units’ performance and reliability. You should clean the pool/spa filter regularly to avoid damage to the unit as a result of the dirty or clogged filter. The area around the unit should be dry, clean and well ventilated. Clean the side heating exchanger regularly to maintain good heat exchange and to save energy. Check the power supply and cable connection often. Should the unit begin to operate abnormally or do you smell something unusual around the electrical compartment, switch off the heat pump and have it replaced on a timely manner.